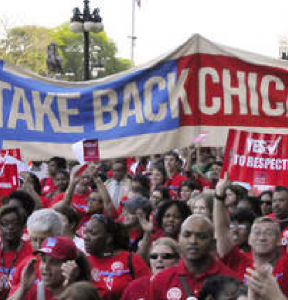 Home > Posts > Sarah Jaffe: Who cares for Chicago's children? Sarah Jaffe: Who cares for Chicago's children? The announcement on May 24 that the Chicago public school system and Mayor Rahm Emanuel would close 50 schools – out of the 54 they’d wanted to close – shook the streets of the US’ third-largest city, but was largely met with silence outside of the state of Illinois. As the Chicago school board voted to send kids walking through gang territory to unfamiliar schools, Kristof was busily touting the value of “girls’ education” and combating poverty and complaining about American Airlines, but not a tweet was to be found about those children he supposedly cared so much about. Nearly 90 percent of the children who will be forced to attend new schools are black, but nary a pundit clutched their pearls about that. It was the same in many places: Too much silence as the largest school closings in Chicago’s history were voted on, as parents, teachers and students filled the streets and halls with protest and song, sat in, were arrested, and vowed to keep fighting. In the case of Time magazine, reporters who should have known better took Mayor Emanuel’s side, declaring that he’s “fighting failing schools” without an understanding of what it means to fight failure by closing up shop and disrupting students’ lives even more. The mayor cares, we are to understand, because he says he does – never mind how many children, parents, and yes, unionised teachers tell him that his policies hurt. But the public school teachers and parents, who not only say that they care but back it up with action, are never taken at their word the way the rich are. Perhaps they didn’t want to be on the same side as the union on this issue. 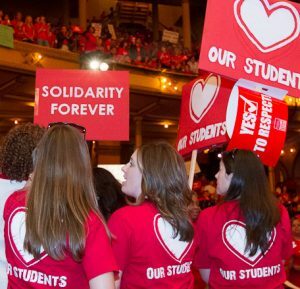 Karen Lewis and the Chicago Teachers Union have led the charge to save the schools, filing federal lawsuits to try to stop the closings, arguing that the closures violate the Americans With Disabilities Act and the Illinois Civil Rights Act. MSNBC’s Chris Hayes and Melissa Harris-Perry did feature the story on their programmes – Hayes hosted Lewis herself, along with NYU education professor Pedro Noguera. Harris-Perry hosted nine-year-old Chicago student Asean Johnson and his mother Shoneice Reynolds, a school worker and participant in last fall’s strike, along with reporters Allison Kilkenny and Daniel Denvir, Philadelphia Student Union activist Sharron Snyder and former Virginia governor Douglas Wilder. Click here to continue reading Sarah Jaffe’s take on school closings and the media.